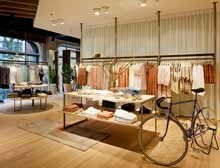 THE PANEL of Procos, which tracks the performance of specialized chains in France, reported that sales in October declined by 4 per cent against the same month a year earlier, with the largest declines being recorded by apparel and restaurant chains. Both city centre (-4.6 percent in high streets) and suburban stores (-3.4 per cent in shopping malls) suffered from the recorded decline. The figures are based on data supplied by 50 chains in 50 sectors in 15 metropolitan areas. Later in the week, figures published by the Institut français de la mode (Ifm) showed that French consumption of textiles and apparel in October had declined by 8.7 per cent year-on-year. At the end of October, government figures showed a further rise in unemployment, which threatens to continue sapping consumer confidence.